November 22 -- The Help the Hungry Bake Sale has continued its tradition of raising more money each year than in the previous year. The 2014 edition’s gain was $7,000 more than last year – which brought its total to a record $52,300. All receipts benefit the Ministerial Alliance Food Pantry and the St. Vincent DePaul Food Pantry. 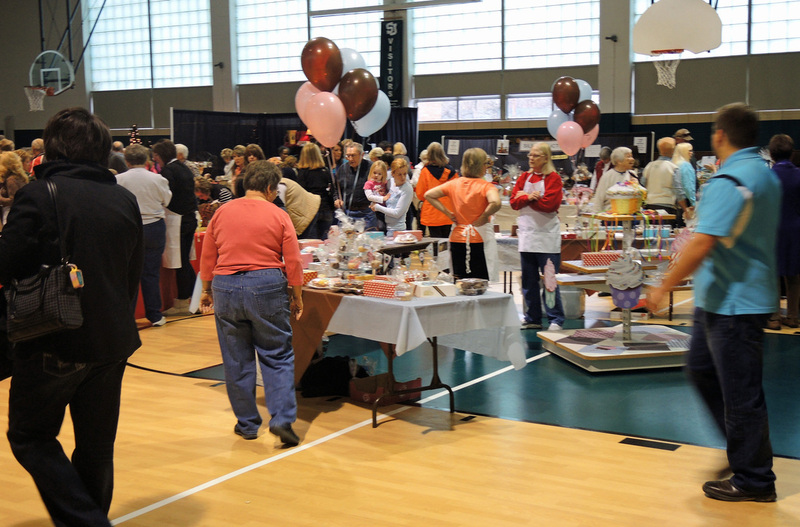 As in the past, this year the event was held at the St. Jospeh Catholic School gymnasium, where swarms of volunteers manned the various booths that sold a wide variety of baked goods plus numerous other items that are often used as Christmas gifts. Again this year, the cake sales got the most attention as the clergy cake auction alone raised an impressive $10,250 for just the nine cakes up for bid. Top earner again went to Father Rickey Valleroy of St. Joseph’s parish for his “Hershey milk chocolate” creation that he said included almost sinful but yet forgivably delightful ingredients such as 12 candy bars, "mucho" whipped cream and one very special item: holy water. That cake alone brought in $3,500. Valleroy’s parish men also sponsored a Lenten dinner that also raised another $7,000 for the event. Meanwhile, Chris Landrum’s desert package set a new record high by bringing in $3,000.